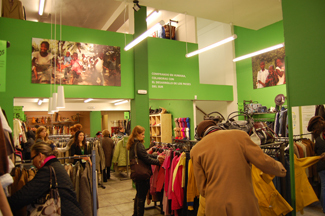 Humana has opened its ninth store of clothing and footwear used in Madrid. This new facility is located on Calle Antonio Lopez, 61, Metro Marqués de Vadillo. On the occasion of the opening, Humana has given 200 pieces of all people who have come to the facility. The objective of this action was to publicize the work of the Foundation about textile recycling as a means to boost cooperation in the development and environmental protection. 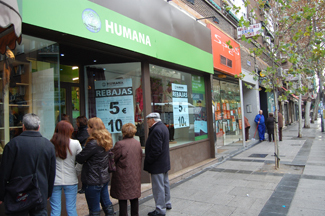 Humana also wants to celebrate the opening of the twenty-fifth store in Spain and Portugal, coinciding with the commemoration, in 2012, the twenty-fifth anniversary of the beginning of the activity of the Foundation in our country. Humana's new store in Madrid has a sales area of ? ?140 square meters on two floors where you can buy clothes and accessories for women, men and children as well as footwear and home textile. On the occasion of the opening, all items for sale at the new store has a special price of 5 and 10 euros. The clothes on sale at the new store come from the more than 18,000 tons of clothing and footwear worn by Humana collects each year in more than 4,000 containers that account in Spain. The proceeds from the 25 stores are for Human development cooperation programs.